Like any other data sotrage device, Network Attached Storage (NAS) devices are affected by failures of various nature. For a user, it means impossibility to access important data stored on the NAS device. If your NAS has broken, do not try to rebuild it. Functions named "Rebuild", "Restore", etc. usually reinitialize an internal RAID array or do something similar. As soon as the rebuild is finished, you get a perfectly working but absolutely empty NAS volume. To recover data from the failed NAS, first you need to extract the drives from the NAS box. Read here to know why it is necessary and how to do this correctly. Connect the NAS drives to a PC running Windows. Direct connection via SATA cables is a preferable option, but if your motherboard lacks SATA ports, you can use USB-to-SATA cables. Download, install and run special NAS recovery software - ReclaiMe File Recovery. 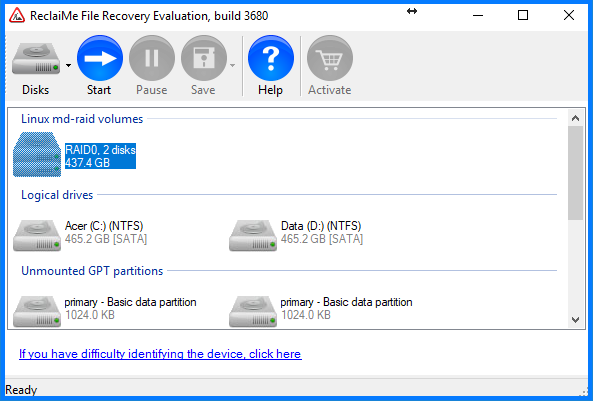 Select the NAS volume from the list of available devices for recovery. Your volume will probably be located under one of the following sections: Linux md-raid, Linux LVM, or BTRFS section. Wait till the end of scanning and check the recovery quality using the Preview function. If you are satisfied with the recovery, purchase a license key and copy the data to a storage device prepared in advance. if you haven’t found your NAS volume in the device list displayed by ReclaiMe, your RAID configuration is probably severely damaged. Before starting the NAS recovery, you need to recover the array configuration parameters using ReclaiMe Free RAID Recovery software.